Mappy is a video game designed by Namco and released in 1983. Mappy is a side scrolling platform game featuring ‘Mappy’ the police mouse. In Mappy, cat burglars have hidden stolen loot in their mansion and Mappy must maneuver around and recover the stolen items, while avoiding contact with the cats. Mappy can also score points when bouncing on the trampolines, hitting a cat with a door, microwaving a cat, and retrieving a stolen item when Goro (the boss cat) is hiding behind it. One some levels, bells will appear that can be dropped on cats for more bonus points. Mappy can’t be harmed by the cats when bouncing on the trampoline or in the shafts of the mansion. If Mappy jumps on a trampoline when it is red (unless there is a lower level to catch Mappy), or is touched by a cat on any of the mansion floors, he will lose a life. Levels 3, 7, 11, and 15 are bonus rounds where Mappy must pop balloons for bonus points. After round 15, the game loops back to the beginning. Based on the NAMCO Super Pac-man board, the arcade unit used two Motorola 6809 CPUs with a Namco 8 channel PSG for sound. In the U.S., Mappy was distributed by Bally-Midway and came in both upright and cocktail cabinet versions. Mappy was ported to the Famicon (NES) in Japan, but not to any Atari systems until now. Mappy is the latest release from Champ Games, released by AtariAge at the 2018 Portland Retro Game Expo (PRGE). Programmed by John Champeau, with sprites by Nathan Strum, and music by Michael Haas, Mappy is an amazing game for the Atari 2600. John also credits Darrell Spice, Jr. for the music driver and Thomas Jentzsch for code optimization and improving the logo. Taking full advantage of CDF (the latest incarnation of DPC/DPC+) and the Melody board (designed by Fred Quimby), Mappy delivers a near arcade level experience on the Atari 2600. Comparing John’s 2600 port to the arcade version, shows an amazing level of fidelity to the original. Just like the original, the music is almost constant. Only a few Atari games like Pitfall II, Stay Frosty 2, and, now, Mappy have this much music in them. In addition to offering three levels of difficultly (that can be selected from the main menu), John takes advantage of the difficulty switches to offer random locations of loot and reduced object flicker. He also uses the color/BW switch to allow for pause/resume of the game. Finally, Mappy can take advantage of the Atarivox to save high scores. Mappy comes from AtariAge with a full color box, manual, and poster. The box and cartridge art are the work of Nathan Strum who also did a fantastic job on the manual. The twelve page manual is printed on glossy paper and includes four pages of a Mappy comic book. It probably seems like I am usually positive about the things I write about on this blog. That’s probably a fair point as I have a tendency to write about things that I like. This time it is a little different as I was not at all familiar with Mappy. In fact, until last week, I hadn’t even played Mappy. A friend showed me how the game was played on the AtariAge demo unit at PRGE and I bought a copy from AtariAge. Turns out that I have one of the Jack’s Pacific Namco ‘Plug ‘n’ Play’ units that has Mappy on it. In the past week, I have played Mappy on both my Atari 2600 and on my Namco unit. Sometimes you don’t know what you are missing; Mappy is a great game and a lot of fun to play! At PRGE, I had the opportunity to talk with John and his brother Paul. Although John is rightfully proud of his work on Mappy, he made it a point to talk about the team effort by Mike, Nathan, Thomas, and others that was needed to make Mappy for the Atari 2600 a reality. Like many of John’s recent releases, you have to keep reminding yourself that you are playing a 2600 game. Mappy should be available for purchase in the AtariAge store next month. This is one game that should be on every Atari 2600 owner’s wish list! P.S. Mappy plays great on Atari 7800 units as well! Categories: 2600, 7800, Atari, Game Reviews, Uncategorized | Tags: 2600, 7800, Atari, game, Game Reviews, Homebrew, Mappy, Namco, retro, VCS | Permalink. A radar screen and status board tell you when an enemy is in range and in which direction you need to turn your tank to engage or avoid attack. The status board also shows your score and the number of tanks (lives) remaining. When your tank is ‘killed’, a simulation of your periscope screen cracking is displayed. Battlezone was ported to several computer systems of the day and an Atari 2600 version, using raster graphics, was released in 1983. An Atari 5200 version that uses a combination of vector and raster graphics was in development, but never released. A copy of a playable prototype is available and seems to be about 90% complete. Activision also developed their own tank game for the Atari 2600 called Robot Tank. Released by Atari in 1983, the Atari 2600 port of Battlezone uses raster graphics versus the vector graphics of the arcade. Instead of a periscope view, the game features a pseudo 3D view of the front of the players tank. The game includes enemies from the arcade; tanks, super tanks, and UFO’s (saucers), but substitutes the missiles for fighters. The 2600 version plays like the arcade version and the graphics are nicely done; even the radar and status displays are included. The one thing missing, which does detract from the game, however, is the battlefield obstacles. Use of the obstacles by both the player’s and enemy tanks is an important part of the strategy of the game. Extra lives are rewarded at 50K and 100K points. Designed by Alan Miller, Robot Tank was also released in 1983. Robot Tank is similar to Battlezone but adds several new twists. First, no points are awarded; instead, the number of enemy tank kills are tracked. Extra lives are awarded after an entire enemy squadron of tanks are destroyed. In Robot Tank, damage to the player’s tank is possible which can cause the screen view to black out, the radar can be lost, cannons to be damaged and fire erratically, and, finally, tank treads can be damaged, making it difficult to maneuver. Additionally, a full day period is modeled, causing visibility to be limited at dusk and at night. Alan also modeled fog, rain, & snow which also limits visibility and forces the player to rely on the radar screen. If radar is lost at night or in the fog, you will be driving blind! One weakness of Robot Tank is that, if the player turns the his/her tank so that an incoming round is no longer in view, it will miss the player’s tank. This is, of course not realistic and is, honestly, a flaw in the game. Both Battlezone and Robot tank are great games for the Atari 2600. The graphics in both are outstanding and they are both fun to play. One note of caution for Atari 7800 owners is that Robot Tank is one of a handful of games that does not work on most 7800’s. I was able to pick up boxed copies of Battlezone and Robot Tank for around ten dollars each. At that price, why not get both of these great games? Wild for Atari 2600 Tank Games! Categories: 2600, 5200, 7800, Atari, Game Reviews, Uncategorized | Tags: 2600, 7800, Atari, Battlezone, game, Game Reviews, Robot Tank, VCS | Permalink. ‘Scramble is a video game developed by Konami in 1981 and distributed in the United States by Stern. It is a side scrolling ‘shoot ‘em up’ with outstanding graphics and game play. In Scramble, you control an aircraft with the goal of getting as far into the Scramble system as possible. In addition to controlling the movements of the aircraft, you must also use your guns and bombs to destroy rockets, UFO’s, and fuel tanks. You must keep an eye on your own fuel and destroy a fuel tank to increase your fuel level. Thanks to Paul Lay, it is now possible to play Scramble on the Atari 5200. At this stage, you can download it to play on a 5200 emulator or on real hardware via an Atarimax cart. Paul had worked on the graphics for Scramble a while back but didn’t really get started on programming it until the beginning of this year. For the most part Paul worked on it, quietly, by himself, but, then, Harvey Kong Tin (long time Atari graphics artist) pitched in and helped with the graphics. One area where Paul’s Scramble shines is with the sound. Unlike TIA sound on 2600 and 7800, Scramble for the 5200 takes advantage of the 5200’s pokey chip. The Defender inspired ship explosions do differ from the arcade version, but are a blast (pun intended)! Also, the stage and score are at the bottom of the screen versus the top in the arcade version. Scramble 5200 is addictive and takes a lot of practice. I have played for hours and have only made it to level 6 once. The game options, that Paul has programmed in, make it easy to get started and work your way up in difficulty. Scramble 5200 would have been a massive hit back in the day and would have helped the 5200 live up to its billing as the ‘Super System’. Scramble for the 2600 and 7800 systems are awesome, must have games for those systems, but Scramble 5200 is as close to the arcade as you are going to get, unless you go and buy yourself an authentic arcade unit. Let’s hope Paul authorizes a cart/manual/box release for Scramble 5200. Not only do I highly recommend this game, I want to be the first in line to order a copy!!! Categories: 5200, Atari, Game Reviews, Uncategorized | Tags: 5200, Atari, Game Reviews, retro, Scramble | Permalink. Super Cobra is a video game developed by Konami in 1981 and distributed in the United States by Stern. A further development of Scramble, it is also a side scrolling ‘shoot ‘em up’ with outstanding graphics and game play. In Super Cobra, you control a helicopter with the goal of getting 10,000 miles, grab the booty, and carry it away. In addition to controlling the movements of your helicopter, you must also use your guns and bombs to destroy rockets, tanks, and fuel tanks. You must keep an eye on your own fuel and destroy a fuel tank to increase your fuel level. Stage 11: Base-maneuver your helicopter over tall buildings, missiles, and tanks to reach the Booty and safely carry it away. The Super Cobra arcade units were powered by two Z80 CPU’s and two AY-3-8910 sound generators. It was ported to the Atari 2600, Atari 5200, Atari 8-bit systems, Intellivision, and Colecovison. Most recently, and updated version has been ported to the Atari 2600. In 1983, Parker Brothers released their port of Super Cobra for the Atari 2600. At the time, it was considered a decent port and received a certificate of merit at the 1983 Arkie Awards. With the recent release of Super Cobra Arcade for the 2600, this 1983 port is now one to skip. Thanks John Champeau, it is now possible to play an almost arcade perfect port of Super Cobra on the Atari 2600. John took advantage of the work that he had done on Scramble and adapted his code to produce an outstanding port of Super Cobra. Super Cobra was released by AtariAge at the 2017 Portland Retro Gaming Expo with a color manual, poster, and an amazing box. Several other AtariAge forum members contributed to the game, including Nathan Strum (graphics), Michael Haas (music, sound effects, label, box, and manual design), Darrell Spice (level generation and code) and Thomas Jentzsch (level generation and code). Super Cobra for the 2600 is amazingly close to the arcade version and, when playing it, you have to keep reminding yourself that it is an Atari 2600 game. Like a few other recent homebrew games, John takes advantage of the Melody board to make the 2600 do things once thought not possible! The graphics and sounds are outstanding, and all eleven arcade levels are included. A really cool feature that John built into the 2600 version of Scramble is the ability to use a Sega Genesis controller. If plugged in before your 2600 is powered up, Scramble will auto-detect the Genesis controller and allow two button game play (for separate control of firing bombs and missiles). John also takes advantage of the 2600’s color/B&W switch to implement a pause feature in the game as well as the difficulty switch to allow for single shot or ‘burst mode’ when shooting missiles. Like Scramble, Super Cobra is a fun game, but takes a lot of practice. John has built in four difficulty levels into his 2600 version which will keep you coming back for more. Also, John has included the ‘continue’ feature of the arcade, so you can play on, even when the game should be over. Super Cobra Arcade for the Atari 2600 is a must have game for your collection! The 5200 version was also released by Parker Brothers in 1983, is faithful to the arcade version and includes all eleven levels. I have seen reviews that state difficulties with using the 5200’s analog joysticks. It probably would have been a wise idea to either make the caverns wider or do so via a menu selection or difficulty setting, but I have played it with a 5200 joystick and a CX40 (via a masterplay clone adapter) and find it challenging, but not impossible. Obviously, the better your joystick, the easier it will be to score higher at Super Cobra. Like John’s 2600 version, Parker Brothers included the continue feature which adds significantly to the enjoyment of the game. Unfortunately, Parker Brothers did not take advantage of the keypad on the 5200 controller and add any game options. The only option is for the # key to select a one or two player game. Additionally, only the lower fire button is used, which fires both missiles and bombs. Despite these shortcomings, Super Cobra is a definite ‘must have’ for your 5200 collection. A simple graphics hack of Bob DeCrescenzo’s Scramble has been made available by Good Deal Games and, until John’s 2600 version was released, this was as close as you could get to Super Cobra on the 7800. John’s 2600 plays great on the 7800 and includes all Super Cobra levels and features, so it’s buyer’s choice as to which way to choose if you have a 7800. Wild for Super Cobra Arcade! Categories: 2600, 5200, 7800, Atari, Game Reviews | Tags: 2600, 5200, 7800, Atari, Game Reviews, Super Cobra | Permalink. Scramble is a video game developed by Konami in 1981 and distributed in the United States by Stern. It is a side scrolling ‘shoot ‘em up’ with outstanding graphics and game play. In Scramble, you control an aircraft with the goal of getting as far into the Scramble system as possible. In addition to controlling the movements of the aircraft, you must also use your guns and bombs to destroy rockets, UFO’s, and fuel tanks. You must keep an eye on your own fuel and destroy a fuel tank to increase your fuel level. The Scramble arcade units were powered by two Z80 CPU’s and two AY-3-8910 sound generators. It was ported to the Commodore 64, Vic 20, and Vectrex, but not to any Atari systems. Scramble was succeeded by ‘Super Cobra’ which was ported to the Atari 2600, 5200, and 8-bit systems. Thanks to John Champeau, it is now possible to play Scramble on the Atari 2600. John started his work on his port of Scramble in 2015 and it was released by AtariAge in mid-2017 with a color manual, poster, and an amazing box. A number of other AtariAge forum members contributed to the game, including Nathan Strum (graphics), Bob DeCrescenzo (music and sound effects), Michael Haas (sound effects), and Dave Dries (label, box, and manual design). Additionally, Darrell Spice helped with the DPC+/ARM code and Thomas Jentzsch helped with testing. Scramble for the 2600 is amazingly close to the arcade version and, when playing it, you have to keep reminding yourself that it is an Atari 2600 game. Like a few other recent homebrew games, John takes advantage of the Melody board to make the 2600 do things once thought not possible! The graphics and sound are outstanding and all six arcade levels are included. Scramble is a fun game, but it takes a lot of practice to get good at it. John has built in four difficulty levels which will keep challenging you as you get better at the game. Scramble is an awesome side scroller for the 2600 which not only pushes the system to its limits, but, also shows that, some forty years after it was first released, the Atari 2600 is still a great home gaming system. John has really ‘knocked it out of the park’ with Scramble…an absolute must have for your 2600!!! P.S. Scramble also plays well on the Atari 7800! Categories: 2600, 7800, Atari, Game Reviews | Tags: 2600, Atari, Game Reviews, VCS | Permalink. Asteroids Deluxe-developed by Bob DeCrescenzo and currently available from AtariAge. The original Atari version of Asteroids (3D Asteroids) for the 7800 is pretty good, but Bob takes it to the next level. Asteroids Deluxe features simulated vector graphics, killer satellites and is about as close to the arcade as you are going to get on a home system. As a bonus, a simulated vector edition of Asteroids is also included (just hold down the pause key when you power up your 7800)! b*nQ-developed by Ken Siders and currently available from AtariAge. Ken has developed a near arcade perfect port of Qbert for the 7800. Qbert is an arcade classic and Ken’s version is a blast to play and good for hours and hours of fun! Centipede-one of the original games for the 7800, programmed by General Computer Corporation (the designers of the 7800). The 5200 version of Centipede is probably the closest to the arcade, but the 7800 version is still a great game and a blast to play. One thing that sets Centipede for the 7800 apart is the two player team variation. This game is fun to play, but even more fun with two people. 7800 Centipede carts are plentiful and can usually be had for five dollars or less. Commando-developed by Dwain Skinner for Sculptured Software/Atari and released in 1989. I prefer the traditional arcade games like most of the ones in my top ten, but Commando stands out for its game play, awesome graphics, and Pokey sound. In order to save space on the motherboard, provisions were made to allow for Pokey sound chips to be added to 7800 cartridges. Unfortunately, due to costs, only two 7800 games actually had Pokey chips in the carts (Ballblazer and Commando). Commando earns its way onto my list as it shows what Atari could have with the 7800. Unfortunately for the collector, Commando is one of the harder games to find. Dig Dug– another one of the original 7800 games developed by GCC for Atari. This is an awesome port and belongs in every 7800 collection. It would have been better had Atari choose to include Pokey sound, but is still a great game, is a blast to play, and can typically be had for five dollars or less. Donkey Kong XM (or PK)-by Perry Thuente. The best port of Donkey Kong for any home console…period. See my recent post about this awesome game. Perry spent more than a year developing the most accurate port of Donkey Kong …ever! The only way to get a better version of Donkey Kong at home would be to buy your own arcade cabinet!!! Galaga-yet another one of the original 7800 games developed by GCC for Atari. The 7800 version is probably one of the best ports available for a home console. Even with all of the motion on the screen, there is no slow down and no flicker. This game is a blast to play and can typically be had for five dollars or less. Moon Cresta– developed by Bob DeCrescenzo and currently available from AtariAge. If you like Galaga, you will love Moon Cresta. Bob to great efforts to get the alien movements as close to the arcade version as possible. Even on the ‘easy’ setting, Moon Cresta is a challenging game that will have you hitting the reset button over and over. Pac-Man Collection– developed by Bob DeCrescenzo and currently available from AtariAge. I get to cheat here as this cart includes a whole bunch of Pac-Man games including: Pac-Man, Pac-Man Plus, Hangly Man, Ms. Pac-Man, and Ultra Pac-Man. Bob had originally developed these separately, but with efficient programming, he was able to squeeze them all onto a single 32K cart. This cart will give you hours and hours of fun and belongs in every 7800 collection! 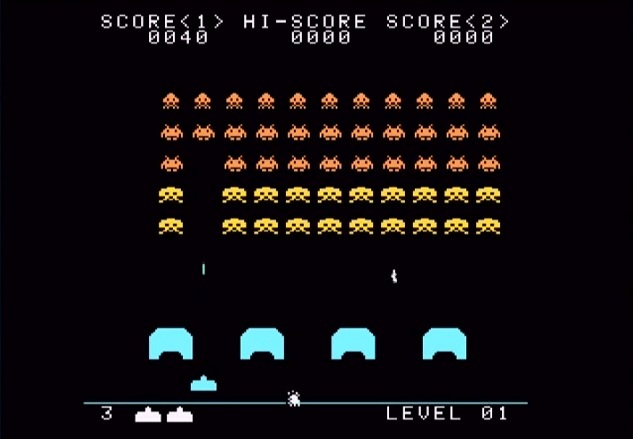 Space Invaders– developed by Bob DeCrescenzo and currently available from AtariAge. Like most everyone that had an Atari 2600 in the early 80’s, I played Space Invaders over and over again. The 2600 version was actually pretty darn good, but Bob shows how great the 7800 can be as a home arcade system. His version totally rocks and has all kinds of options such a moving shields, zigzagging bombs, and invisible invaders. Alien Brigade-developed by Ken Grant for Atari. One of the later releases for the 7800 (and challenging to find), Alien Brigade is an awesome game with outstanding graphics. It is the best of the five light gun games developed for the 7800 (although it can also be played with a normal controller). Atari never released the light gun for the 7800, so you will have to find an XEGS model or get one from Best Electronics. Plutos-developed by Kevin Franklin at Tynesoft and never officially released. An unstable prototype was discovered by Curt Vendel in 2008 and Bob DeCrescenzo, Mitchell Orman, and Eckhard Stolberg collaborated to get the code stable on stock 7800 consoles. The graphics in Plutos (and its sister game Sirus) are stunning and really show what the 7800 is capable of. Had this game been released in the 80’s, it would have been a top seller for sure! More than half of my favorite 7800 games are homebrews by Bob, Perry, & Ken. It is really amazing that, some thirty years after the 7800 was designed, new games are still being developed. In fact, several new games have been recently finished and will be released soon. It also shows that had Atari released the 7800 in 1984, as originally planned (vs. 1986), that many more games probably would have been made available. Categories: 7800, Atari, Game Reviews | Tags: 7800, Atari | Permalink.